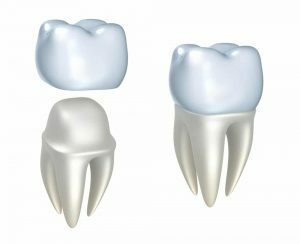 Many patients mistakenly believe that if a tooth requires a crown, it also requires a root canal. While this is not always true, it can be a bit confusing because teeth that require root canal therapy most often do, in fact, require a crown. So what’s the difference? We will attempt to resolve the confusion. A crown is a tooth-shaped covering that is placed over a tooth to restore its shape, size, strength, and improve its overall appearance. Crowns fully encase the visible portion of the tooth. 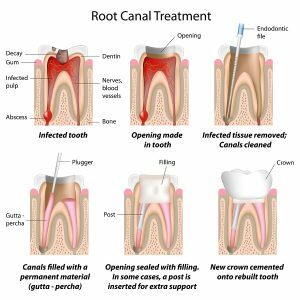 Root canal therapy repairs and saves a an infected or badly decayed tooth. During root canal therapy we remove the pulp, or nerve, of the tooth. Finally, we clean and sterilize the inside of the canals. After root canal therapy is completed, the treated tooth requires a crown to provide more strength to the slightly weakened tooth. At Adams and Cheek Dentistry, we strive to give our patients optimal dental care while providing as many services as possible in-house. We perform most root canal therapy procedures in our office but will refer to a specialist for more complicated procedures. Please contact Adams and Cheek Dentistry by clicking here or calling 919.866.1360.